SIMS, N.C., Sept. 27, 2017 – For the drivers of Jerry T. Bunn Trucking LLC and its sister company, Bunn Hauling Inc., the old adage “the more things change, the more things stay the same,” couldn’t be much truer. 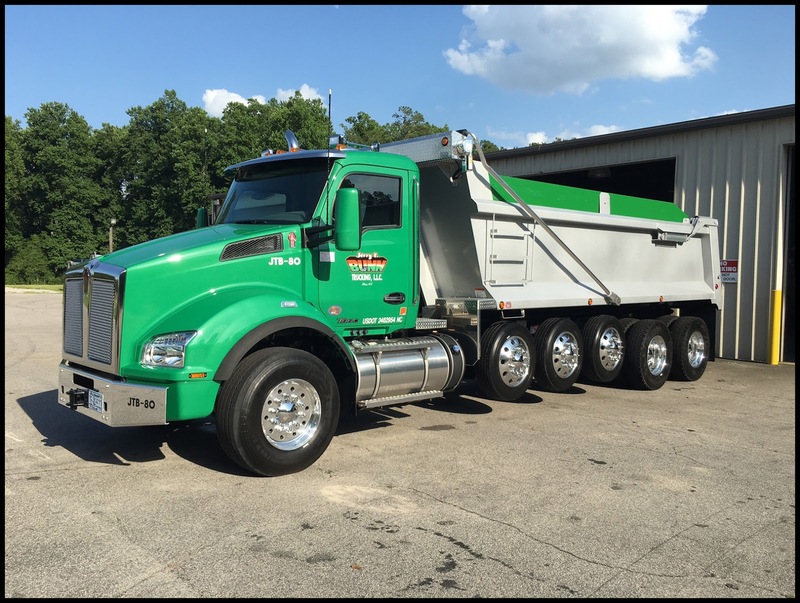 When it came time to replace trucks in 2016, Jerry T. Bunn Trucking and Bunn Hauling bought 22 Kenworth T880s equipped with 455-hp PACCAR MX-13 engines and 10-speed Eaton UltraShift(R) Plus automated transmissions from MHC Kenworth – Raleigh. 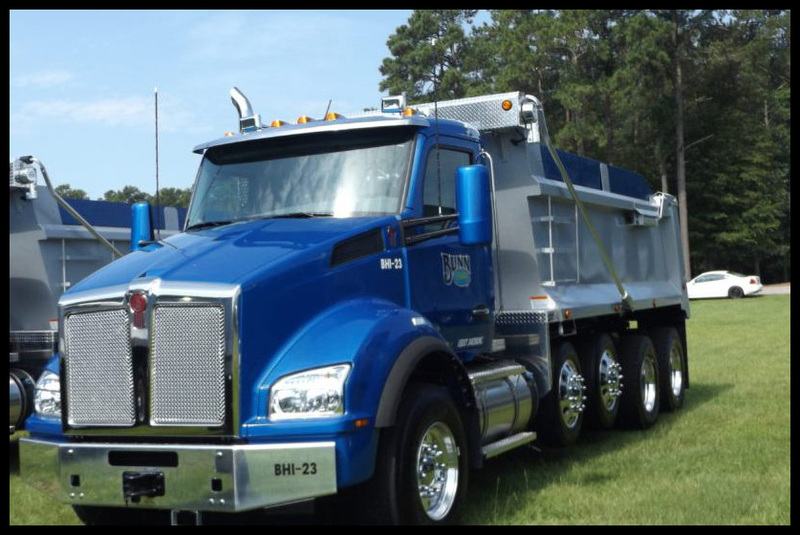 “Our drivers have been very satisfied with the Kenworth T880,” said Jerry Bunn, who manages the day-to-day operations of both Bunn Hauling (the trucking firm, started several years ago by his wife, Cheryl) and Jerry T. Bunn Trucking (founded by his father). 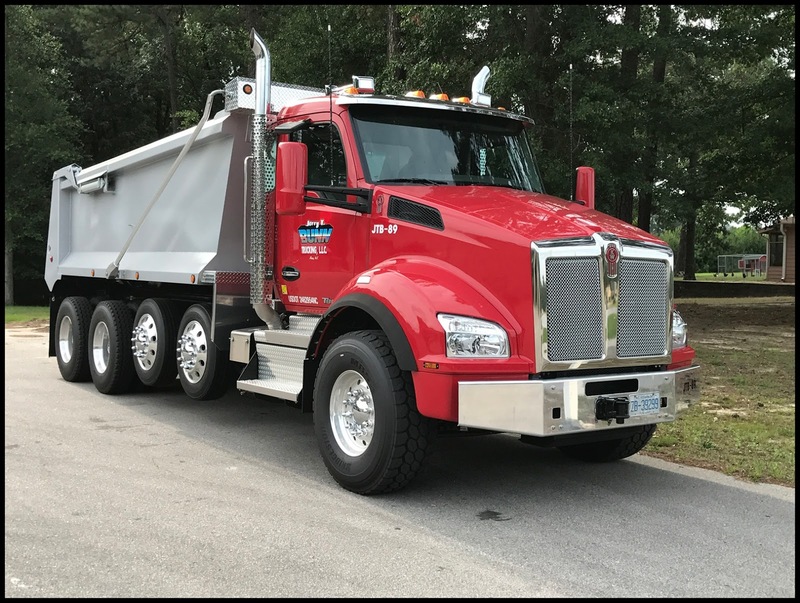 “The truck cab is quiet, and the PACCAR MX-13 engine and the transmission work well together, providing smooth shifting and steady power at low speeds. Jerry, who began driving trucks for his dad’s company during his senior year in high school 21 years ago, knows from personal experience how quiet and comfortable the T880 cab is for drivers. He has driven Kenworth’s flagship vocational model himself. Comfort is an important consideration because it helps them stay alert and focused throughout the day, Jerry said. The T880 also offers a great turning radius and excellent visibility, which is important when drivers are delivering products from local quarries to commercial and residential projects, particularly in urban areas. While some things have changed at Sims, North Carolina-based Jerry T. Bunn Trucking since Jerry Bunn Sr. owned the aggregate hauler, others have not. The company’s drivers, as in the past, still leave early in the morning and make as many as three dozen deliveries of dirt, gravel or rock in a single day. As a result of Jerry Bunn Sr.’s passing from kidney cancer in 2010, his wife (Kaye) now owns Jerry T. Bunn Trucking. When it came time to start replacing the 58 trucks in both company’s fleets, the Bunns looked for models that could meet their needs. 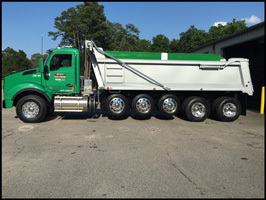 And just as important, they wanted trucks and after-the-sale support that they could depend to make on-time deliveries of dirt, sand, gravel and rock for highway projects and a variety of different commercial and residential construction and remodeling projects. 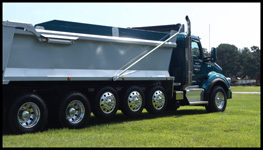 The companies use a variety of 3- and 4-axle straight dump trucks along with some tag-axle trailers – depending on the amount of product the jobsites require to be delivered. 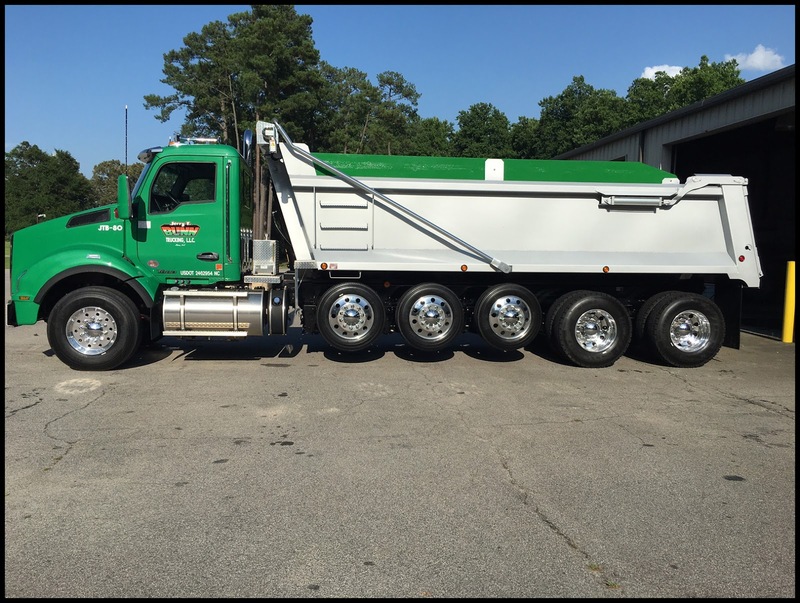 Since taking delivery of the first T880s, Bunn Hauling, along with Jerry T. Bunn Trucking have bought a total of 38, some equipped with 6-speed automatic Allison transmissions. 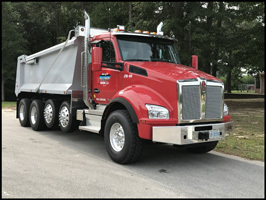 Last year, Jerry T. Bunn Trucking took delivery of two six-axle Kenworth T880 dump trucks equipped with 46,000-pound tandem suspensions and 54-inch axle spacings, plus two 13,500-pound steerable pusher axles to carry more payload per trip. 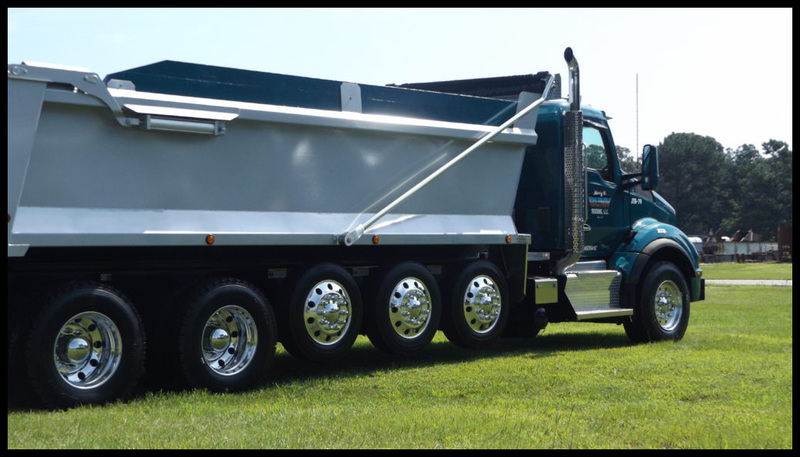 The tandem suspensions help the trucks maintain greater stability control for those larger loads with a high center of gravity. The steerable lift axles spread out the weight of larger loads, making them conform to North Carolina’s bridge formula weight limits. Both six-axle trucks serve as cancer awareness trucks. They are painted green and not Jerry T. Bunn Trucking’s typical choice of red and teal. (Bunn Hauling runs blue T880s.) The green T880s not only serve as a visible reminder of the importance of cancer screening and awareness, but also memorialize the late Jerry Bunn Sr. himself. The six-axle trucks will be particularly important, as trucks from both companies haul aggregate to North Carolina Department of Transportation’s four-lane 12.6-mile extension from North Carolina 11 in Ayden north to Highway 264 and Stantonsburg Road in Greenville, North Carolina. That project, known as the Greenville Southwest Bypass Project, began in September and is expected to be completed in 2019. By carrying women-owned business certification under the Women’s Business Enterprise (WBE) program with the U.S. Small Business Administration, and Historically Underutilized Business certification with the North Carolina DOT, both companies can bid on contracts that provide preferential treatment to women-owned businesses. 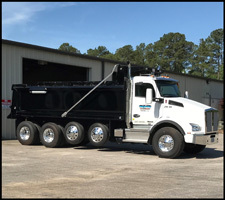 While these certifications open up new opportunities, Jerry said attention to the needs of their customers has been the primary way Jerry T. Bunn Trucking and Bunn Hauling maintain strong relationships. 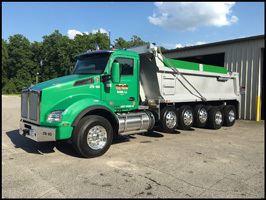 The after-the-sale support from Kenworth PremierCare(R) Gold Certified dealer MHC Kenworth-Raleigh has helped both companies further cement their solid reputations. Gold Certified Kenworth dealers go above and beyond industry standards to help fleets and truck operators maximize uptime with a range of premium services. This includes extended evening and weekend operating hours, rapid diagnosis of estimated repair time in two hours or less, dedicated technicians with training to use Kenworth TruckTech+ and service PACCAR engine.